In zones téthysiennes (alpine ocean), Foraminifères planctoniques serve as reference. In the English-Parisian Pond, these are plentiful only in Cénomanien, so that we hold essentially Foraminifères benthiques for the stratigraphical datings. 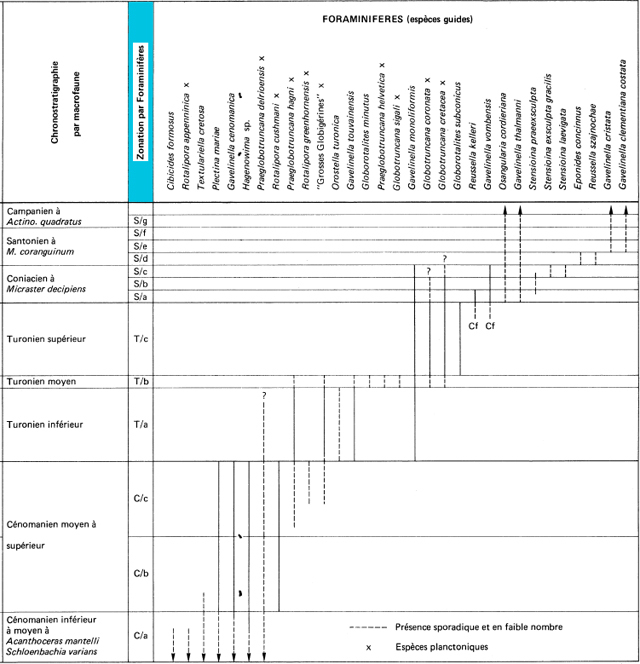 For the establishment of the geologic card of France, the scale initially proposed by Monciardini (1977) was held, but it underwent since numerous revisions. We shall refer to the recent works of I. Wilkinson on the Isle of Wight. Some foraminifères large-sized, for example Labyrinthidoma Can be useful on the ground.